This country fell off the Fiscal Cliff in 2001 when George Bush II was president. The Federal Debt is presently $16.3 trillion. It was “only” $5.8 trillion when took office in 2000 which he proceeded to increase by $6.2 trillion during his 8 years in office. Obama then added $6.0 trillion during his first 4 years. The budget deficit (ie. our debt) has grown by approx. $1.4 trillion per year during each of Obama’s first 4 years in office — more than the total U.S. national debts from the date of our independence to the year 2000, with several world wars, the Korean War, the Vietnam war, the Great Depression, and the 40 years in cold war with the Soviet Union. Speaker of the House (Republican) John Boehner and President Obama are pretending to attack the debt problem. The President wants an additional $120 billion in tax hikes on the rich each year, and is offering a nebulous possible $40-80 billion in spending reduction each year. The Republicans want more spending reduction and less taxation on the rich, or at least the closing of loopholes. So we have on the table a possible $160-200 billion in deficit reduction on the table for a wildly out-of-control federal deficit of $1400 billion per year and rising. Do the math. Some very unqualified people from both political parties continue to posture and debate numbers that would reduce the deficit to $1.2 trillion/year instead of $1.4 trillion. At this point it is mathematically impossible to solve this equation, especially by politicians who are who are more interested in winning the next election and who are absolutely unqualified to deal with the problem, or even more basic … to add up the numbers. Had the Federal Reserve not manipulated interest rates to zero, there would have been an additional $600-800 billion/year added to the federal deficit for each of Obama’s first 4 years for the payment of additional interest on the debt. E Pluribus Unam found on U.S. coins and dollar bills comes from Latin and translates to “out of many, one”. It stands for out of the many (13 colonies) was formed one strong nation. This motto was first proposed by the U.S. Continental Congress in 1782. It first appeared on U.S. coins in 1795, on the “Half Eagle”, a 5-dollar gold piece. 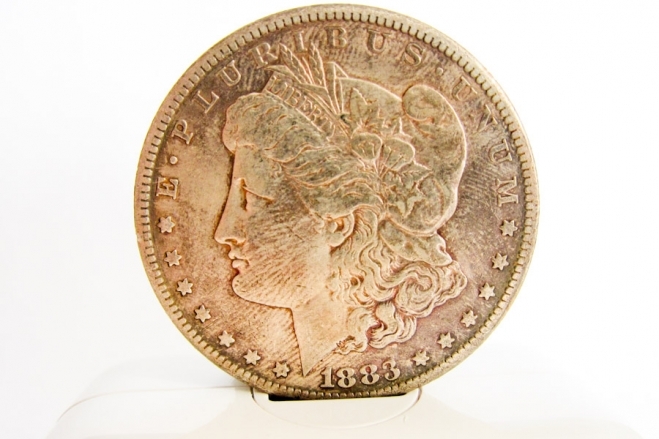 For the next 65 years, it appeared and was removed from U.S. coins until 1866 when it became a permanent fixture on all U.S. coins and bills, such as the U.S. silver dollar. Moving ahead to December 2012, this motto might be interpreted in a completely differently way — out of many many dollar bills (almost 50 dollars) , you would have the purchasing power of a U.S. dollar bill or silver dollar from of 1920. In less than 100 years, the the U.S. dollar has lost almost 98% of it value, or purchasing power. The largest industry in the U.S. is the electronic printing press owned by the Federal Reserve. It is currently producing dollars out of thin air at the rate of 1.4 trillion per year. The total value of goods and services in the U.S. economy is approximately $17 trillion dollars. So, the federal government has manufactured dollars for the last 4 years at a level equal to almost 10% of our Gross National Product (GNP). The reason they print dollars is because no one, not China or Japan, is willing to purchase any more worthless U.S. debt (U.S. treasury notes). In case you have not seen the figures, during each of these last 4 years, the federal govt. has taken in an average of $2.2 to 2.3 trillion in revenues, and has spent an average of $3.6 trillion, without ever approving any budget. Almost all of this increase in the annual deficit is from spending. Where the annual budget under Bush was $2.5 trillion, for the last 4 years under Obama it has mushroomed to $3.6 trillion … and we have not even started on Obamacare and all the other social entitlement programs that will be coming our way during the next 4 years. The U.S. federal debt is $16.35 trillion, broken down as follows: approx. $5 trillion is owed to other U.S. government entities which are mainly IOU’s to the non-existent Social Security Trust Fund plus Medicare and Medicaid; and the remaining $11 trillion is debt is owed to the public and foreign entities. Half is held by the U.S. public ($5.5 trillion) and half is held by foreign investors, with China and Japan each holding approximately $1.1 trillion each. The U.S. makes minimal real interest payments on the $11 trillion (not much when interest rates are ~1%), and a theoretical interest on the IOU’s to itself. The estimated 2012 interest total to be paid by the Treasury dept. on the federal debt is now between$240-480 billion, depending upon how the real versus the theoretical is calculated. So we find ourselves in a situation where politicians make you think that they are fighting for a real deficit solution, while only attacking $200 billion of an annual $1400 billion deficit. While you wonder when some day you hard-earned savings or retirement money might actually earn any interest, consider that the 0.2% annual interest your bank is paying you on you savings while food, rent and other expenses are increasing at 5-10% per year, is actually an additional real tax on you by the federal government that is manipulating the money supply and interest rates paid by banks. Seagate ships its products to and buys machinery from over 40 different countries around the world. Therefore we have to deal with changes in relative valuations of foreign currencies to each other and the U.S. dollar. Most countries (except China) use similar printing presses to expand their own money supplies in order to pay their bills. Governments know that it is easier to inflate their money supply than to control spending. Inflation is always better than deflation. Article 10 of the Constitution states that no State shall create any bills of credit as tender as payment of debts except gold and silver coins. In 1944, the Bretton Woods treaty established the U.S. dollar as the international currency for exchange, and set the U.S. dollar to a fixed exchange rate of $35 dollars to an ounce of gold. In 1971 as a result of inflation from the Vietnam War, a balance of payments deficit, and a run on the U.S. gold reserves by foreign governments trying to redeem dollars for gold bricks (Fort Knox), President Nixon ended the convertibility of the U.S. dollar to gold. Nixon’s Executive Order 11615 therefore made it no longer obligatory for the Federal Reserve to tie the dollar to anything, setting the stage for it to be able to print as much money as it wishes. 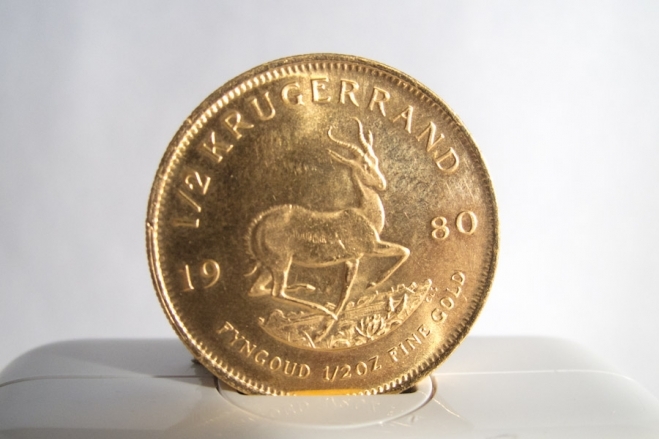 So, half a Krugerrand is not quite as good as a whole Krugerrand …. but it is 900 times better than a U.S. dollar bill and likely to keep on rising as long as we continue to pay our bills with the Federal Reserve printing press. 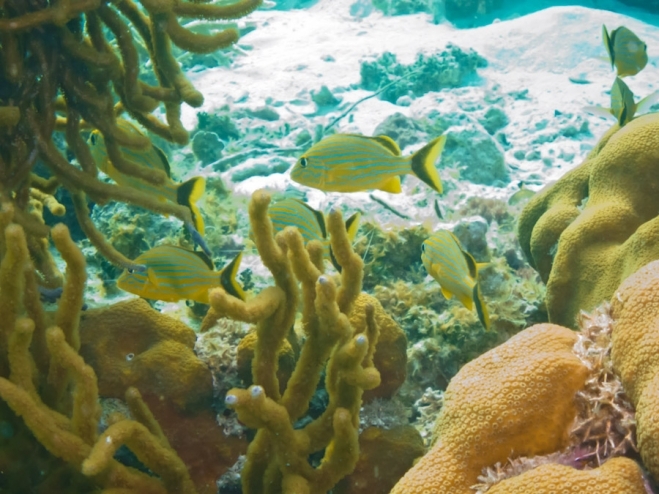 The fish picture of the week is some grunts swimming around a coral reef. Maybe hiding among the coral is not very different from what Boehner and Obama are doing right now rather than trying to fix the problem.